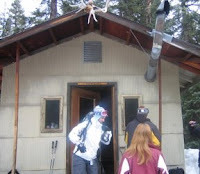 Sneak's Inn (also known as Sneaky's Cabin) was a cabin erected at Snowmass by Jim "Sneaky" Snobble (who died in 2006). Originally it was located near the bottom of the old Sheer Bliss chairlift, and around 1974 or 1975 it was moved to an area near Elk Camp between the Adams Avenue, Turkey Trot, and Slider ski trails. It burned to the ground on October 8, 2007. The next day The Aspen Daily News ran the news article about it shown below. Thanks to Blake Williams for helping the author with the information on this page. See the first four photos of Sneak's Inn shown below. The first photo was taken in March 2007. The photo credit for this photo is: http://teamkellum.blogspot.com/2007_03_01_archive.html. The second photo was taken on November 20, 2005 and the photo credit for this photo is : http://www.flickriver.com/photos/mike_laura/sets/72157594432654512/. The date of the third and fourth photos is unknown and the photo credit for both is this link, which now does not work anymore: http://viewmorepics.myspace.com/index.cfm?fuseaction=viewImage&friendID=55951575&albumID=0&imageID=2041402. The photos following the first four photos show the remains of Sneak's Inn after the fire. “Sneak’s Inn,” a one-room cabin put in place by one of the builders of the Snowmass Ski Area, burned to the ground Monday morning. No one was injured and the cabin had no official use, although people often hung out there and it had a lot of historic and nostalgic value. Jim “Sneaky” Snobble, who surveyed and cut many of the original trails on Snowmass and worked as its mountain manager until he retired in the mid 1980s, put in the cabin, an old race shack, as a kind of retreat in 1974. Over time, it was augmented with a potbelly stove and a three-tiered bunk bed. Tucked away in a clearing in the woods in the general vicinity of Elk Camp, the cabin was hard to find and its location only divulged by word of mouth to a trusted few. For several years the only people who knew about it were ski patrol, trail crew and other mountain employees. In the last decade or so, according to Sewell, more people found out about it and started using it, often staying overnight and cutting and stacking firewood through the summer. One of those devotees is local Michael “Mikey B” Buchanan, who said he’s visited the cabin every season for the past six years, chopped firewood and provided pots and pans for the place. Buchanan said there was no place quite like Sneak’s Inn, “a place to get away from stress of life, maybe go up there with a few friends and a bottle of wine.” He remembers hiking up under a full moon, the cabin’s clearing lit up by moonlight and doing back flips off the picnic table. An Aspen Skiing Co. employee noticed smoke coming from the vicinity of the cabin at about 8 a.m. Monday, said Sewell, and originally thought it was just coming from the wood-burning stove. But when the smoke thickened, a crew went up to the site and found the cabin engulfed in flames. They used fire extinguishers and shovels to contain the blaze, but couldn’t save the cabin. Firefighters and police officers responded and police “didn’t see anything suspicious that led us to believe the fire was a criminal act,” said Snowmass Village Police Chief Art Smythe. Fire marshal John Mele will investigate the scene today. It is generally believed that someone staying in the old structure didn’t put the fire out properly before leaving. SkiCo is not planning to rebuild the cabin. “It’s a tragedy; it’s like losing a family member,” said Buchanan. The photos below show the remains of Sneak's Inn after the fire. This photo and next: This metal box held donated clothes; anyone staying there could help themselves to any of the items for the duration of their stay. Up in Snowmass mountain, hidden from the "non-locals" you can find a cabin in the middle of the woods. It was taken there by helicopter about 40 years ago during the construction of one of the chair lifts by a man who used to work in Snowmass called "Mr Sneaky" and that's why it's called "Sneak's Inn". The cabin is not bigger than 20square meters and it is very rudimentary. It has 3 rather long bunk beds where a maximum of 12 people can sleep. The furniture (chairs) are made out of wood in a way that you can still see the logs. There is a small furnace where logs are burnt to produce heat. The cabin is opened to anybody 365 days a year, there's no need to book it...Anto tells me that so far she's never met another group of people. The people who go there take care of it, they leave some non perishable food, there's some spare jackets, blankets, sleeping bags and shoes. Anto had always talked to me about this cabin, so when I was in Aspen I definitely wanted to go there. We were 7 of us going there: Greg, Deidree, Murphy, Anto, Gus, Jason and me. We took the last gondola of the day at 4pm from the bottom of "Fanny hill" in Snowmas mountain. After we went all the way to the top we had to ski a little and then we had to hike for some minutes until we found the cabin, hidden in between some trees. The hike was a very short one, however the snow was "rotten", this means that every couple of steps one of us would manage to sink a whole leg in the snow. The first time this happened to me, I freaked out a little bit...cause it is very tough to pull it out, and if you are not used to it, it can be a little scary. Of course afterwards I realised that it happened to everyone and that it was just a matter of being patience and careful and eventually you could be back on your feet! The place was amazing. The guys made a nice fire outside where we sat around while having beers, eating and chatting. Of course the guys are rather hyperactive and they had to find ways to entertain themselves and burn some energy....so they did all kinds of things such us cutting wood, small fights, invent silly little games, sled or chase each other around in the snow! By clicking on the links on the previous sentence you can view small videos! Once it was dark, and it got a little colder we all went inside. Some of the guys cooked some food, some attempted to play the guitar, some danced ;-), we played some Jenga. We had plenty of fun. One of the interesting experiences was going trying to pee in the dark. It reminded me of camping in the beach back in Peru...of course there is easier as it is not cold, you don't sink in the snow and somehow you can see a little better. Anto and me would go with the head lamp and some toilet paper....and everything was so still and so quiet and so surrounded by trees....it was kind of scary! However it all looked so nice. We were up in the mountain and the sky looked so big and dark and so full of stars! The next morning we woke up rather late (at 9am) consid ering that we were all in bunk beds....it felt a little like being in a pyjama party because we were all talking to each other and we were laughing non stop...I was sleeping in the middle bunk so it was just funny to have someone talking to me from the top bunk and from the bottom one. After cleaning and tidying up we all skiied down the mountain all the way to "the mall" in Snowmass where we all shared a really nice breakfast. My visit to the cabin was definitely a really nice experience!